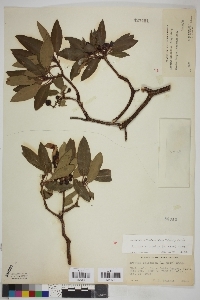 Arbutus arizonica (A. Gray) Sarg. Trees, 3-8[-10] m; bark light gray to reddish gray, checkered with squarish to rectangular segments or plates, 1-4 × 1-2.5 cm, retained on bole and major limbs; twigs 3+ years old with brick-red outer bark exfoliating in flakes or, sometimes, in slender strips. Leaves larger on sterile shoots with longer internodes; petiole (often red), (1-)1.7-3.2(-4.2) cm, base slightly decurrent, glabrous; blade slightly lighter green abaxially, olive-green and glossy adaxially, ovate, (2.5-) 3-7.5(-9) × (1-)1.8-3(-4) cm, base usually tapered-acute, rarely slightly rounded [broader and more nearly ovate-lanceolate], apex usually acute, sometimes slightly acuminate, surfaces glabrous. Inflorescences often congested; axes densely hairy, hairs sometimes glandular. Pedicels accrescent, obliquely erect or slightly pendulous, 2.4-5 mm (to 16 mm in fruit), densely hairy, hairs sometimes glandular; bract clasping base, reddish, scalelike, 1.4-2 mm. Flowers: calyx pale green, lobes 1.1-1.5 mm (mostly hidden beneath corolla), apex obtuse or rounded; corolla 5-5.6 mm; anthers 1.3-1.5 mm, spurs 1/2-2/3 times length of thecae, (finely tuberculate); ovary with (2-)3-5+ ovules per locule. Berries blackish red, 6.5-9 mm diam. Seeds ca. 2 mm. Flowering May-Jun(-Aug); fruiting Aug-Oct. Riverine forests and oak parklands along seasonally moist waterways; 1500-2400 m; Ariz., N.Mex. ; Mexico (Chihuahua, Durango, Jalisco, Sinaloa, Sonora, Zacatecas). Two outstanding features of Arbutus arizonica distinguish it in the field: 1) the consistently narrow, glossy leaves with tapered leaf bases, and 2) the nonexfoliating bark that acquires a checkered appearance within a few years. Trees with the narrowest leaves overall and the most narrowly tapered bases occur in the populations in the extreme northern part of the range in Cochise, Graham, Pima, and Santa Cruz counties of southeastern Arizona and Hidalgo County in southwestern New Mexico. PLANT: Trees and sometimes shrubs; trunks with checkered gray bark; branches with smooth reddish bark. LEAVES: lanceolate to elliptic, 5-12 cm long, 1.5-3.5 cm wide; blades light green, glossy above, pale green below, glabrous; bases rounded to cuneate; tips acute to rounded. FLOWERS: pedicellate; sepals 2-2.5 mm long, lobed with membranous margins; corollas 6-8 mm long. FRUITS: 8-10 mm in diameter, semi-fleshy, orange, edible (Fig. 2A). NOTES: Canyon bottoms and hillsides in oak-pine zone: Cochise, Graham, Pima and Santa Cruz cos.; 1200-2500 m (4000- 8200 ft.); May-Jun; se AZ and sw NM to Jal. and S.L.P., Mex REFERENCES: John L. Anderson, 2008, Vascular Plants of Arizona: Ericaceae. CANOTIA 4 (2): 21-30.